Figure 12-1 shows the Metal tessellation pipeline, which uses a compute kernel, tessellator, and post-tessellation vertex function. Tessellation operates on patches, with each patch representing an arbitrary arrangement of geometry defined by a collection of control points. Per-patch tessellation factors, per-patch user data, and patch control point data are each stored in separate MTLBuffer objects. Optionally, computes per-patch user data. Optionally, computes or modifies patch control point data. Note: The compute kernel does not need to be executed every frame to compute the per-patch tessellation factors, per-patch user data, or patch control point data. You can compute this data every n frames, offline, or by any other runtime means, as long as you supply the required data to the tessellator and post-tessellation vertex function when needed. 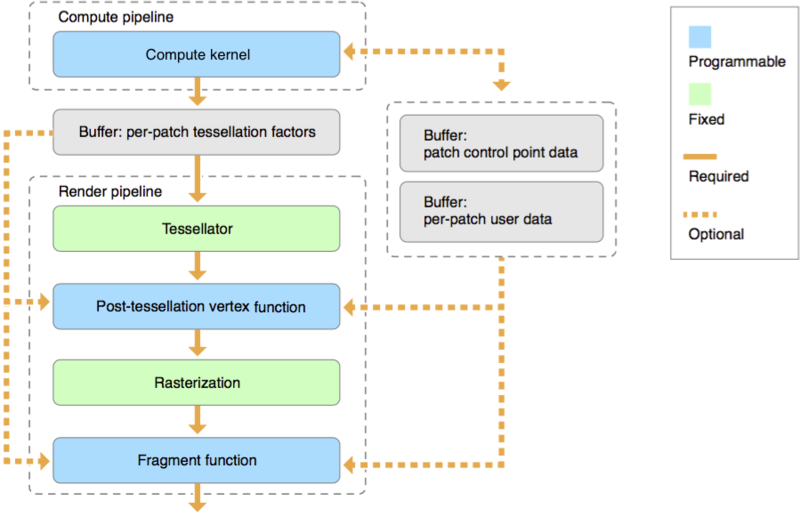 The tessellator is a fixed-function pipeline stage that creates a sampling pattern of the patch surface and generates graphics primitives that connect these samples. The tessellator tiles a canonical domain in a normalized coordinate system, ranging from 0.0 to 1.0. The tessellator is configured as part of your render pipeline, using a MTLRenderPipelineDescriptor object to build a MTLRenderPipelineState object. The inputs to the tessellator are the per-patch tessellation factors. The normalized vertex coordinates on the patch (output by the tessellator). The per-patch user data (optionally output by the compute kernel). The patch control point data (optionally output by the compute kernel). Any other vertex function inputs, such as textures and buffers. The post-tessellation vertex function generates the final vertex data for the tessellated triangles. After the post-tessellation vertex function has completed execution, the tessellated primitives are rasterized and the remaining stages of the render pipeline are executed as normal. Per-patch tessellation factors specify how much each patch is subdivided by the tessellator. Per-patch tessellation factors are described by the MTLQuadTessellationFactorsHalf structure for a quad patch or the MTLTriangleTessellationFactorsHalf structure for a triangle patch. Note: Although the structure members are of type uint16_t, the per-patch tessellation factors fed to the tessellator must be of type half. For quad patches, the position in the patch is a (u, v) cartesian coordinate that indicates the horizontal and vertical position of the vertex relative to the quad patch bounds, as shown in Figure 12-2. The (u, v) values range from 0.0 to 1.0 each. edgeTessellationFactor provides the tessellation factor for the edge of the patch where u=0 (edge 0). edgeTessellationFactor provides the tessellation factor for the edge of the patch where v=0 (edge 1). edgeTessellationFactor provides the tessellation factor for the edge of the patch where u=1 (edge 2). edgeTessellationFactor provides the tessellation factor for the edge of the patch where v=1 (edge 3). insideTessellationFactor provides the horizontal tessellation factor for all internal values of v.
insideTessellationFactor provides the vertical tessellation factor for all internal values of u. 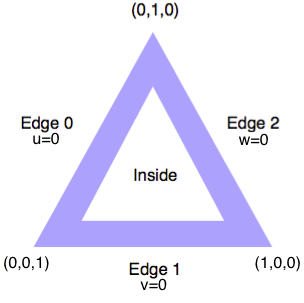 For triangle patches, the position in the patch is a (u, v, w) barycentric coordinate that indicates the relative influence of the three vertices of the triangle on the position of the vertex, as shown in Figure 12-3. The (u, v, w) values range from 0.0 to 1.0 each, where u+v+w=1.0. edgeTessellationFactor provides the tessellation factor for the edge of the patch where w=1 (edge 2). insideTessellationFactor provides the inside tessellation factor. 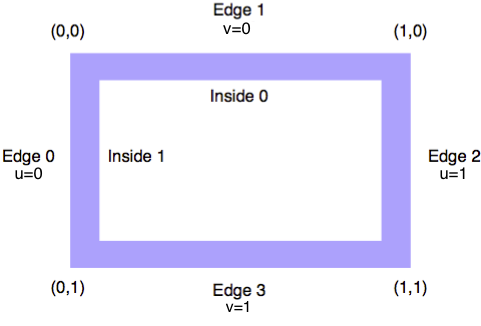 If the value of an edge tessellation factor is either negative, zero, or corresponds to a floating-point NaN, the tessellator discards the patch. If the value of an inside tessellation factor is negative, the tessellation factor is clamped to the range defined by the tessellationPartitionMode property and the tessellator does not discard the patch. If the patch is not discarded and the tessellationFactorScaleEnabled property is set to YES, the tessellator multiplies the edge and inside tessellation factors by the scale factor specified in the setTessellationFactorScale: method. When a patch is discarded, no new primitives are generated, the post-tessellation vertex function does not execute, and no visible output is produced for that patch. Per-patch tessellation factors are written into a MTLBuffer object and passed as an input to the tessellator by calling the setTessellationFactorBuffer:offset:instanceStride: method. You must call this method before issuing a patch draw call to the same MTLRenderCommandEncoder object. This section summarizes the main changes to the Metal shading language to support tessellation. For further information, see the Functions, Variables, and Qualifiers chapter of the Metal Shading Language Guide. A compute kernel is a kernel function identified by using the existing kernel function qualifier. Listing 12-1 is an example of a compute kernel function signature. Compute kernels are fully supported by the existing features of the Metal shading language. The inputs and outputs of a compute kernel function are the same as a regular kernel function. A post-tessellation vertex function is a vertex function identified by using the existing vertex function qualifier. Additionally, the new [[patch(patch-type), N]] attribute is used to specify the patch type (patch-type) and the number of control points in the patch (N). Listing 12-2 is an example of a post-tessellation vertex function signature. Note: In OS X, you must always specify the number of control points in the patch. In iOS and tvOS, specifying this value is optional. If this value is specified, it must match the value of the numberOfPatchControlPoints parameter of the patch draw call. Resources such as buffers (declared in the device or constant address space), textures, or samplers. Per-patch data and patch control point data. These are either read directly from buffers or are passed to the post-tessellation vertex function as inputs declared with the [[stage_in]] qualifier. Built-in variables, listed in Table 12-1. The per-instance identifier, which includes the base instance value, if one is specified. The base instance value added to each instance identifier, before reading per-instance data. Defines the location on the patch being evaluated. For quad patches, must be float2. For triangle patches, must be float3. The outputs of a post-tessellation vertex function are the same as a regular vertex function. If a post-tessellation vertex function writes to a buffer, its return type must be void. This section summarize the main changes to the Metal framework API to support tessellation, pertaining to the tessellation pipeline state. The tessellator is configured as part of your render pipeline, using a MTLRenderPipelineDescriptor object to build a MTLRenderPipelineState object. The post-tessellation vertex function is specified with the vertexFunction property. Listing 12-4 demonstrates how to configure and build a render pipeline with a tessellator and a post-tessellation vertex function. For further information, see the Specifying Tessellation State and MTLTessellationFactorStepFunction section of the MTLRenderPipelineDescriptor class reference. 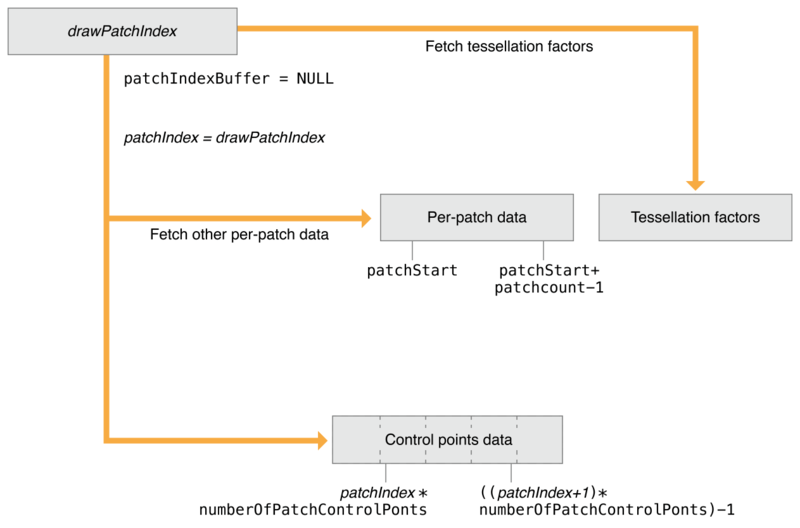 This section summarize the main changes to the Metal framework API to support tessellation, pertaining to the patch draw calls. Note: These patch draw calls can only be called if the vertexFunction property is set to a post-tessellation vertex function; calling a non-patch draw call causes the validation layer to report an error. Patch draw calls do not support primitive restart functionality. For all patch draw calls, the per-patch data and an array of patch control points are organized for rendering in contiguous array elements, starting from the value specified in the baseInstance parameter. 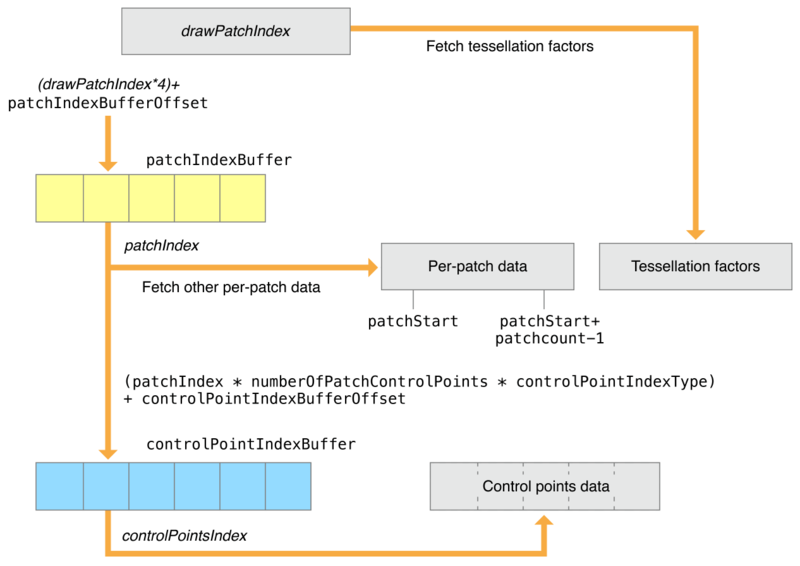 For further information about each parameter, see the Drawing Tessellated Patches section of the MTLRenderCommandEncoder protocol reference. To render patch data, the patch draw calls fetch per-patch data and patch control point data. Patch data is typically stored together for all patches of one or more meshes in one or more buffers. A compute kernel is executed to generate the scene-dependent per-patch tessellation factors; the compute kernel may decide to generate factors only for patches that are not discarded, in which case the patches are not contiguous. A patch index buffer is therefore used to identify the patch IDs of patches to be drawn. A buffer index (drawPatchIndex) in the range from [patchStart, patchStart+patchCount-1] is used to reference data. In cases where the patch indices used to fetch the per-patch data and patch control point data are not contiguous, drawPatchIndex can reference patchIndexBuffer, as seen in Figure 12-4. Each element of patchIndexBuffer contains a 32-bit patchIndex value that references the per-patch data and patch control point data. The patchIndex fetched from patchIndexBuffer is at the location: (drawPatchIndex * 4) + patchIndexBufferOffset. patchIndexBuffer also enables the patchIndex used to read the per-patch data and patch control point data to be different from the index used to read the per-patch tessellation factors. 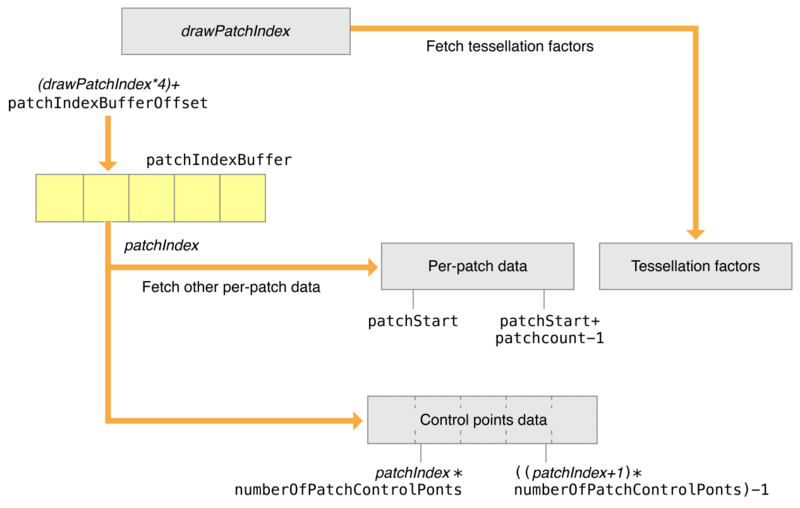 For the tessellator, drawPatchIndex is directly used as an index to fetch per-patch tessellation factors. If patchIndexBuffer is NULL, the drawPatchIndex and patchIndex are the same value, as shown in Figure 12-5. Several (numberOfPatchControlPoints) control point indices must be stored consecutively in controlPointIndexBuffer, starting at the location of the first control point index. For an example of how to set up a basic tessellation pipeline, see the MetalBasicTessellation sample. This section describes how to port a DirectX 11-style tessellation vertex and hull shader to a Metal compute kernel. Note: The Metal tessellator performs the equivalent computations of the DirectX 11 tessellator. The Metal post-tessellation vertex function performs the equivalent computations of the DirectX 11 domain shader. In DirectX 11, the HLSL vertex shader is executed for each control point of a patch. The HLSL hull shader is specified by two functions: a function that executes for each control point of the patch and another that executes per-patch. The output of the vertex shader is input to these two functions that make up the hull shader. Listing 12-5 shows a simple HLSL vertex and hull shader. These simple HLSL vertex and hull shaders can be ported to Metal functions, and a compute kernel that calls these Metal functions can be created that executes these functions as a single kernel. The ported vertex and control point hull functions are called per-thread in the compute kernel, followed by a threadgroup barrier, and then the per-patch hull function is executed by a subset of the threads in the threadgroup. Being able to directly call the translated vertex and hull functions in the kernel makes it really easy for developers to port their vertex and hull shaders from DirectX 11 to Metal. The simple HLSL vertex and hull shaders can be ported to the Metal functions shown in Listing 12-6.
uint numPatches; // total number of patches to process. // not be a multiple of threadgroup size. The threadgroup size should be set to either the SIMD size or a multiple of the SIMD size. The number of patches in a threadgroup is given by threadgroup size / number of control points in a patch. The number of control points per patch is described in the HLSL hull shader. In this porting example, the number of input and output control points are the same. With a few modifications to the compute kernel, the case where the number of input and output control points are not the same can also be supported.